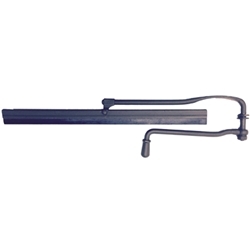 Wiper, windshield, assembly (blade and arm and handle) for all early to mid production WWII jeeps. Wiper, windshield, assembly (blade and arm and handle). These are the best repros avail on the market today. Made just like the originals. All others made are not spring steel on the arm so will bend very easily!! GP-17500 Also correct for early CJ's.